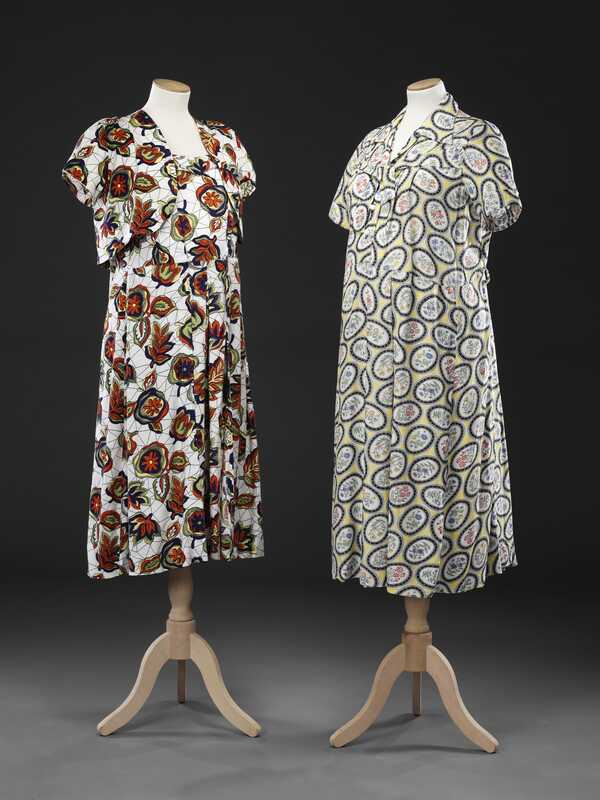 These two commercially produced maternity dresses were worn by the mother of the donor who was pregnant with her in 1953. They are both made of spun rayon, a popular alternative to cotton at the time, being supple and cool to the touch. The Restcot dress on the right of the photograph is printed with sprays of small flowers within oval frames on a lemon yellow ground. 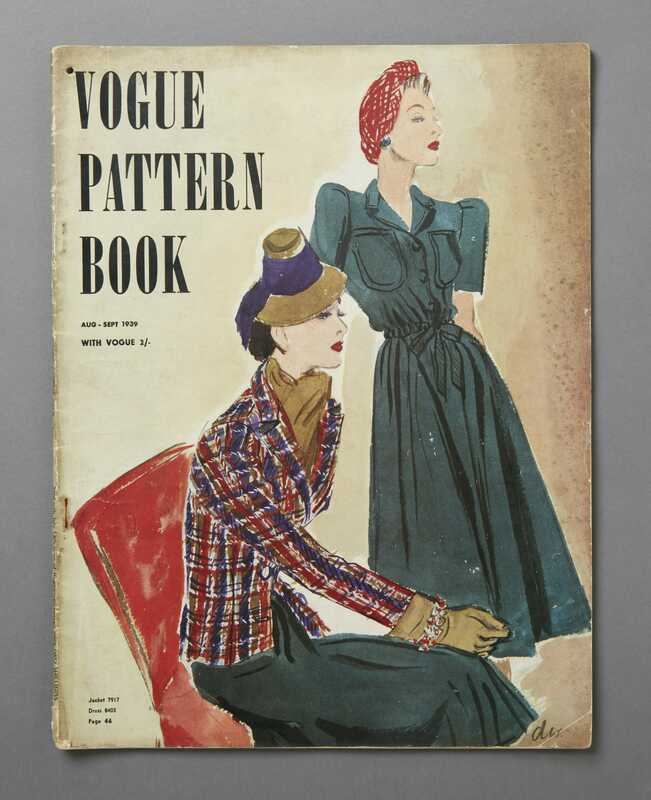 It has been cut very full across the front with a deep pleat on either side of the centre of the skirt, but has no means of adjustment. Originally, it had a belt, now missing. The Harrods sundress and matching bolero are printed in a bold stylised flower and foliage design in strong non-naturalistic colours. 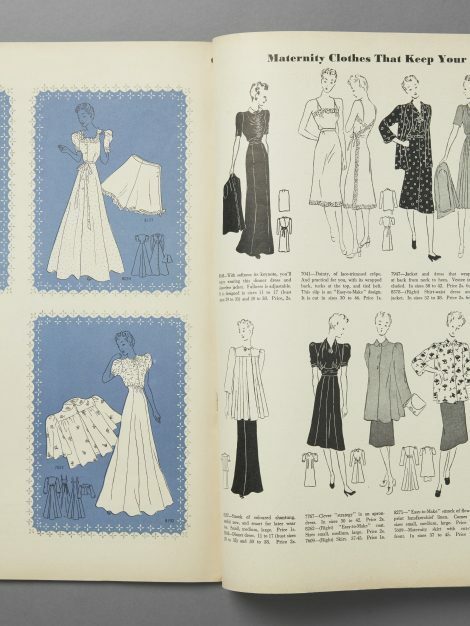 The dress has been cut to accommodate an expanding figure, with a separate front panel tying around the waist apron style, and has an inverted box pleat at the centre front of the skirt. The sides and back have pleats from the base of the shoulder straps, and the skirt is cut with a generous flare, as is the bolero. 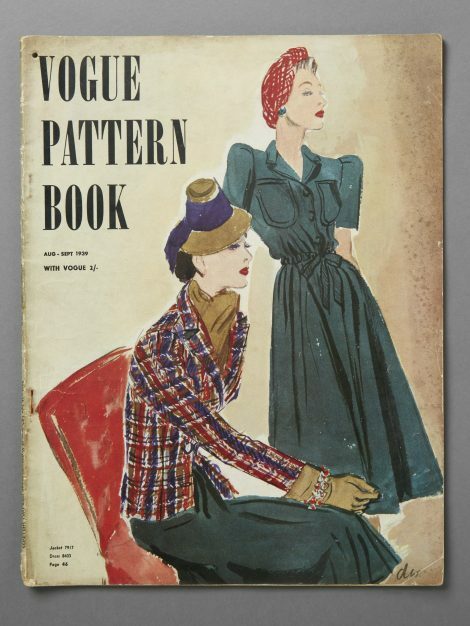 ‘Additional Images’ shows a page from a Vogue Pattern Book of a few years earlier, August to September 1939. 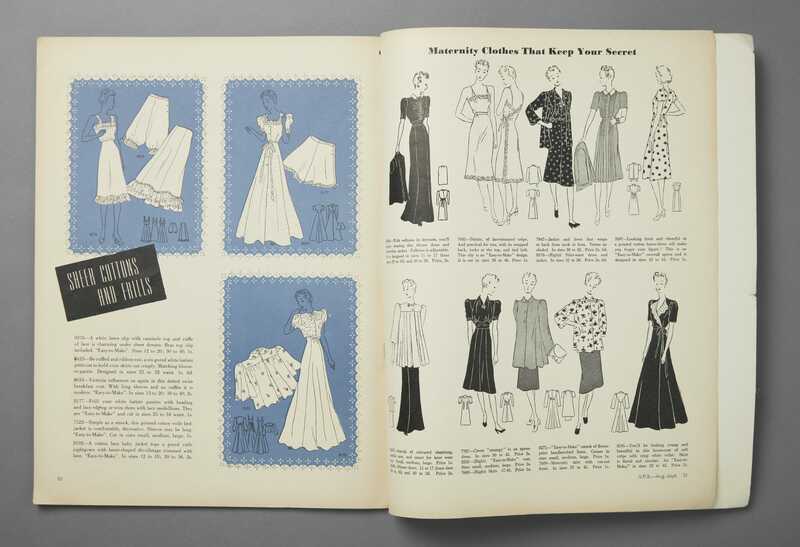 Its title ‘Maternity Clothes That Keep Your Secret’ and the description of one of the paper patterns as ‘a printed cotton house dress [that] will make you forget your figure’ suggest a discreet contemporary attitude to pregnancy. 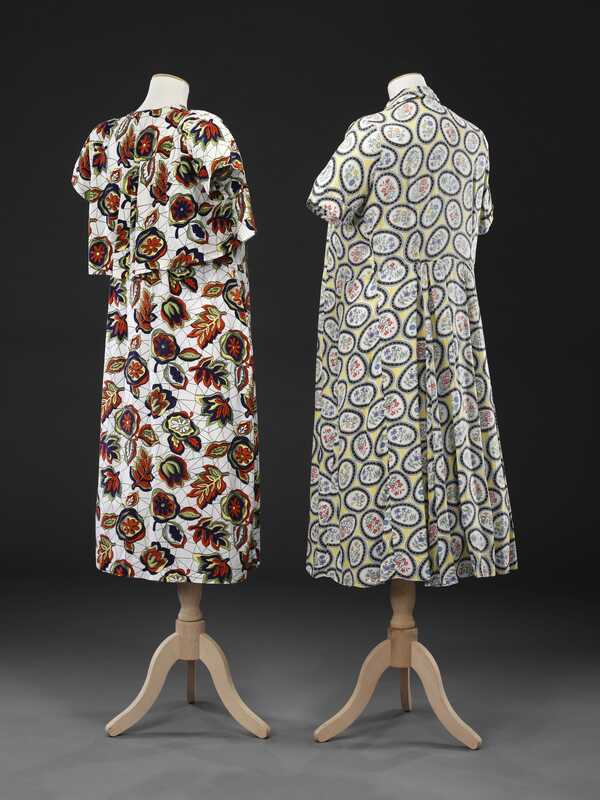 The patterns along the top row are designed with wrapover backs to provide adjustability, the dresses matched with loose jackets. 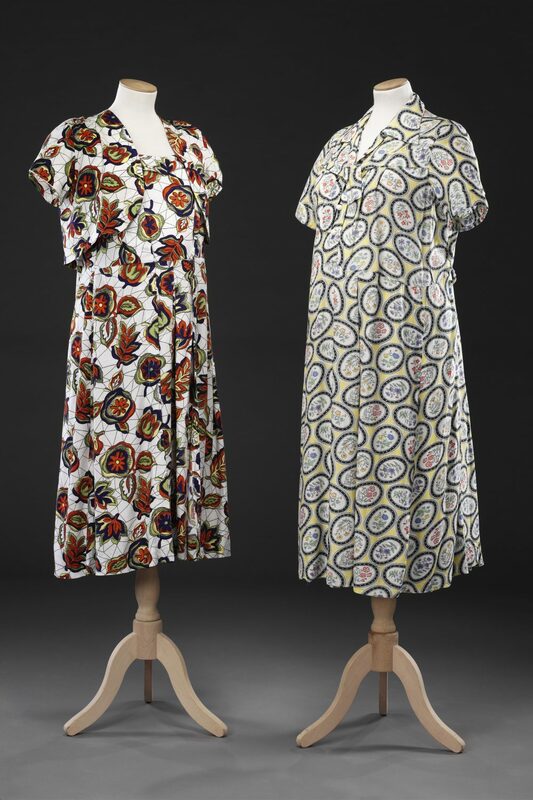 The second row shows several versions of the front fastening smock, a stalwart of the pregnant woman for many years to come, worn with a maternity skirt cut out at the front and a dress with an apron front, and a housecoat with a circular skirt and a wrapover front to give fullness.